Cities worldwide are currently undergoing sustainability challenges, that in combination with climate change and increasingly vulnerable systems, are inevitable, uncertain, and complex. Too significant to solve in isolation, these unstructured challenges necessitate a collaborative urban planning process, amongst multidisciplinary participants from professionalized fields, and the engagement of users and citizens in transition to provide new infrastructure for the co-creation and testing of sustainable services, legislation, and products (Regeer and Bunders 2009, Keyson et al. 2016, Bulkeley et al. 2016, Acuto et al. 2018, Menny et al. 2018, Puerari et al. 2018). It is essential that these new perspectives consider cross-scale and cross-sectoral interactions, interdisciplinary research, understand past, present, and future dynamics encompassing long-term periods, modify organizational methodology and develop new skills and ways of working (Klijn and Koppenjan 2000, Pelling et al. 2015, Den Ouden et al. 2016). Urban labs have emerged as an innovative approach that fosters co-creation through the collaboration of multiple interdisciplinary actors aiming to co-create value which enables innovation for change processes (Veeckman et al. 2013). Aiming to empower various stakeholders and co-create experimental approaches, urban labs develop invaluable insights, used to form policies, inform social innovation design, and inspire participants while remaining participatory and open. This process forges co-creation, which is maintained by the four main urban lab characteristics: aims, activities, participation and context. The performance of which has the potential to facilitate the rate at which cities make ambitious sustainable transitions through co-created contributions. All characteristics are imperative for the success of urban labs; however, the literature does not provide consensus on the predominant urban lab characteristic for fostering high co-creation levels. 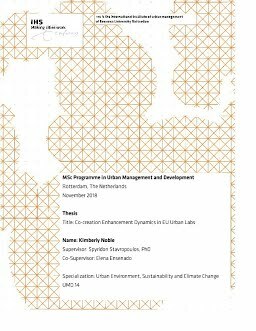 The main objective of this study was to contribute to the existing literature by furthering the understanding of co-creation enhancement in urban labs to improve contribution to urban sustainability. A quantitative analysis was performed to examine survey results derived from urban labs throughout Europe. Each characteristic of these urban labs were assessed through a series of survey questions and by an ordinal logistic regression analysis. This study revealed that all European urban labs exhibited at least one or more co-creation activity, and out of the four co-creation level classifications (high, medium (upper), medium (lower), and low), the majority of these labs occupied medium (upper) levels of co-creation. The findings determined the urban lab characteristic indicators most significant for the explanation of cocreation level variation to be lab focus, clarity of goals, degree of power struggles, predetermination of structure, visibility, and sense of community. After conducting the ordinal logistic regression analysis, it was concluded that the urban lab characteristic most imperative to sustaining high levels of co-creation is “Aims”. A more generalizable deduction could be attained through meta-analysis studies that examine a larger sample size of European urban labs. This research can be utilized to increase understanding of co-creation optimization through application of recommendations applied to current and future urban lab practices.